SUBHEAD: The global sustainable food movement proves that if we accept the responsibility of a new epoch, we can find hope for the future. 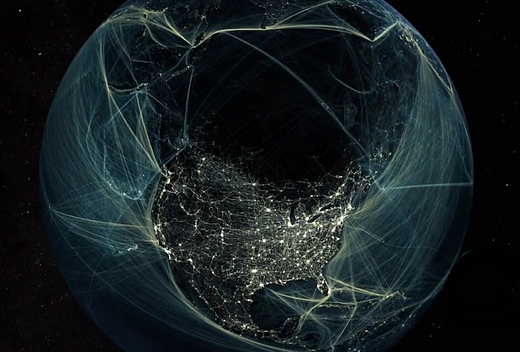 Image above: Anthropocene network of telecommunications in North America visualized at night. From (http://ffffound.com/home/stevijn/found/?offset=400&). Maybe you, too, know that feeling of despair that comes when learning of some catastrophic impact of climate change — a disappearing coral reef, an extinguished species, a rising coastline’s impact on struggling farmers. When I investigated the threats posed to our global food system by climate change and the environmental damage caused by industrial agriculture — as well what people are doing to fix these problems — for my book Consumed: Food for a Finite Planet, I became familiar with this feeling of doom. You see, there’s a flip side to the Anthropocene. On the one hand, the term speaks to the irreparable damage we have caused the biosphere. But if we embrace the term, rather than let it scare us, and accept that having a geological epoch named after us comes with responsibility, then we can find hope for the future. Because once we accept that it is our job to steward this Earth that we’ve already shaped so profoundly, we can start taking action toward improving the prognosis. One example of where this is already happening is with the cultivation of sustainable food systems. Researching this global social movement, I met people in Yunnan, China, who are working with small rice farmers to stop using chemical pesticides and fertilizers and instead nurture the biodiversity of rice paddies. In Lebanon, a man named Kamal Mouzawak has ignited an initiative to preserve the food traditions of his country and promote sustainable agriculture. In Spain there are recently opened shepherd schools where a new generation of people learn how to care for the animals and the landscape, which in turn helps to keep rural regions alive, a vital part of a sustainable food system. In Quebec, a group of farmers are preserving the biodiversity of livestock in the Charlevoix by bringing the Canadienne cattle breed back from the brink of extinction and making delicious new cheeses in the process. In Italy, officials hand over land confiscated from Mafia bosses to the community to grow vegetables. In Nairobi, Kenya, young people are starting urban agriculture businesses and producing food to sell to their neighbors. And all across North America, there are grassroots efforts to create a sustainable alternative to the industrial food system, from rooftop farms to urban gardens to pollinator habitat estoration. Wherever I looked there were people working to make their corner of the world a better place for food. These are the stories that fill me with hope for the future despite that sinking feeling. It has led to the opening of farmers’ market after farmers’ market, urban garden after urban garden, community beehive after community beehive — one project inspiring the next and together equaling social change. If you take a step back and thread these small efforts together, a larger, more robust picture of change emerges. This global movement has successfully lobbied for new food procurement policies at public institutions like universities and hospitals. It has motivated a new generation to take up sustainable agriculture, and new organizations such as FarmStart are educating them. The movement has encouraged politicians to plant vegetables at city hall, such as in Kamloops, British Columbia, and inspired citizens to create food-producing parks such as Seattle’s Beacon Food Forest. Grassroots social action has also helped preserve farmland — witness France’s Terre de Liens, which is raising money from concerned citizens to buy land to be farmed sustainability and kept in trust.